No wood staining project is complete until clear finishes are applied to seal and protect the surfaces. At PaintPlaceNY, we stock a full line of top-quality clear finishes guaranteed to put the perfect finishing touches on your job. Old Masters Interior Water-Based Polyurethane is a clear finish that creates a hard, durable coating and can be used on interior wood, primed metal or fiberglass surfaces and will not amber. 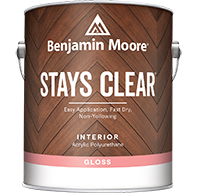 This clear finish for most interior wood surfaces is fast drying, providing great protection and full-bodied brushability. It is available in Satin and Gloss sheens. This is a self-leveling, clear finish designed to protect the beauty of interior surfaces. Easy to apply and quick drying, this polyurethane will provide lasting, durable protection from abrasion, marring, chipping, alcohol and water, and is available in Satin, Semi-Gloss and Gloss sheens. This crystal clear, fast-drying and self-leveling interior lacquer provides a durable finish resistant to water and alcohol. It is easily repaired and recoated without removing the old finish. It is available in Satin, Semi-Gloss and Gloss sheens. This oil-based gel cleared finish produces a soft, hand-rubbed sheen. Its thick formula enables multiple hand-applied coats without drips or brush marks. Classic Wood Finish is an interior, high-solid, oil-based, durable coating that delivers beautiful results in commercial and residential applications. It provides a long-lasting, smooth finish that, when fully cured, resists marring, scuff marks, alcohol and household chemicals. Ultra Polyurethane is an incredibly fast-drying, oil-based polyurethane that dries to a smooth finish on bare wood in just two hours – with no brush marks. Featuring a tough, abrasion-resistant finish and self-leveling properties, it works beautifully on hardwood floors, cabinets, furniture and woodwork. Finishing a bar top and want a gorgeous surface? This product looks stunning while resisting ring marks caused by hot, cold and alcoholic beverages. Tung Oil Wipe-On Finish can be quickly and easily applied with a cloth to produce a smooth, even, protective finish on any interior wood surface. Ultra Max Polyurethane features Dual Drying Technology for a harder “through-cure.” Since you can recoat in just two hours, it’s the perfect choice for heavy-use areas. Self-leveling properties make it ideal for creating smooth finishes on floors, cabinets, furniture and woodwork. This non-yellowing, environmentally safe, clear wood finish is specially formulated to protect and beautify cabinets, furniture, shiplap paneling, woodwork and floors. It dries clear, so you can use it over light-colored or white stains with confidence. It is Exotic Hardwood approved and ideal for use on teak, Brazilian walnut and similar species. From furniture to floors, trust Minwax® products that beautify and protect wood. For superior durability and long-lasting beauty, the choice is clear – protective clear finishes from Minwax®! Durable interior protective finishes that provide long-lasting beauty and protection to any interior wood surface, plus topcoats that offer long-lasting Interior and Exterior protection for wood that is exposed to sunlight, water and temperature changes. This clear finish is for use on wood, fiberglass, coated metal or painted surfaces and contains Ultra Violet Absorbers for advanced sun protection. It is available in Satin, Semi-Gloss and Gloss sheens. This superior exterior coating is formulated to produce a high-quality, flexible finish to withstand water and weather. It also contains Ultra Violet Absorbers for advanced sun protection. It is available in Satin, Semi-Gloss and Gloss sheens. This product is a clear, penetrating oil formulated with natural Tung Oil, suitable for interior and exterior applications. On wood surfaces, it seals out moisture to enhance the life and natural appearance of wood, while preventing staining and checking. On masonry and concrete, it produces a moisture seal that reduces concrete dusting, staining and efflorescence. Ultra Exterior Polyurethane is an incredibly fast-drying, oil-based, clear wood polyurethane finish that dries in only two hours. Formulated with ultraviolet radiation absorbers and antioxidants, it’s specifically crafted to protect exterior surfaces that are subjected to direct sunlight.